12 Last-Minute Birthday Gifts | Top Crochet Patterns ! How often do you forget to make a celebratory present for a loved one? Well, we’re here to tell you that you’re not alone! 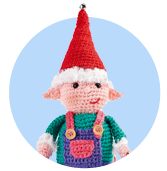 Instead of getting into a panic, we’ve collated an eclectic selection of crochet designs for all skill levels that can be whipped up in a jiffy. If you think a loved one needs a bit of a home revamp, why not crochet this stool cover? It features an array of bright colours, so your recipient will be delighted to accentuate their living space with this snazzy make. You can crochet this in just one weekend, too! Before you take your friend out on the town for her birthday, surprise her with this lovely jewellery set. Use jersey cotton to create the textured bobbles, which can then be stitched onto tapestry to make a bracelet, then hang bobbles from wire supports to create the drop earrings. Your recipient will be able to mix and match these with any outfit. Keep children’s furniture cosy with these animal-inspired chair socks. Hannah Cooper’s quirky designs feature hippo and dinosaur feet that will certainly be a delightful surprise to the child who receives them. If you’ve got a bit more spare time, you can crochet other animals, too. A fancy floral make fits perfectly into an embroidered hoop, and can be hung in a friends room to jazz up their décor. If you’d like to add a sweet flourish, you can embroider a sentiment, too. Transform a loved ones home into a zen paradise with Karen Wiederhold’s intricate crochet dreamcatchers. They are simply worked into the inner part of an embroidery hoop on the last round, but if you’re feeling adventurous, why not mix up the amount of chain loops and double crochet stitches to create an entirely new pattern? If your friend has a green thumb, then making use of these plant hangers is a wonderful way to display greenery. Ali Campbells’ deceptively easy design is also a great way to practise half trebles. If at the end, you’ve enjoyed creating these colourful makes, then why not make a few for yourself, too? If you’ve run out of ideas for children’s makes, these adorable little insects will make great toys, and will only take you an hour to complete. All you need is a quiet place to put your feet up and a stash of yarn. If you’re feeling adventurous, you can crochet a few extras in different colours. This pennant is the perfect hanging to add a touch of personality to any décor. 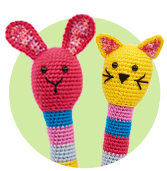 You’ll also get to practise your double crochet stitch, as well as surface crochet and slip stitch to create a sentiment. What’s even better is the fringing effect used to add an extra bit of character. Does your loved one have a craft space that needs a bit of a tidy up? These adorable cactus pin cushions are the perfect gifts to not only brighten up a crafting area, but also to keep it organised. Each of Alli Campbell’s designs feature three different crochet bodies with flower embellishments and facial features. What’s not to love? A cosy cushion will make the perfect addition to any sofa. This fun, contemporary design features triangular shapes and is simple to create. For a more intricate look, try stitching a panel to the cushion front with a contrasting yarn or embroidery thread. Create these cute barefoot sandals for a friend who is going on a birthday beach holiday. Karen Wiederhold’s clever, yet simple make features a triangular design. The loop on the end of each triangle hooks over a toe and the sandals are then secured around the leg with simple crocheted chains. A colourful satchel is the perfect gift for someone who loves to travel with their essentials. Lucinda Ganderton’s stylish design is worked in double crochet which is one of the easiest stitches to learn. While there is a little bit of shaping to be done around the bottom edge of the bag, it’s still a great project for beginners. You can add a bold, patterned lining and leather buckles for a professional finish.